Design, branding and marketing agency based in Kloof, Durban who specializes in print, website, point-of-sale and mobile marketing. 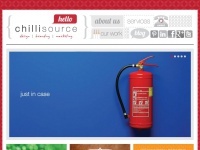 five profiles were found for Chillisource.co.za in social networks. Among other social networks the website is represented in Facebook, Twitter, GooglePlus and Pinterest. The web server with the IP-address 198.57.162.234 used by Chillisource.co.za is owned by Unified Layer and is located in Provo, USA. This web server runs a few other websites, mostly in the english language. The websites of Chillisource.co.za are hosted by a Apache server and were developed in the programming language PHP. The content management system WordPress is used. The HTML pages were created with the latest standard HTML 5. The website does not specify details about the inclusion of its content in search engines. For this reason the content will be included by search engines.